MOTHER TERESA belongs to the whole world—not to Roman Catholics only, not to Christians only. Indeed, she is the first religious figure in history to be revered during her lifetime by adherents of all religions and Christians of all denominations. And when she died in 1997, there was a universal outpouring of heartfelt appreciation and reverence for her long life of service. Humility, simplicity, and sacrifice are the terms most often associated with Mother Teresa and her work—though many who encountered her personally would quickly add tenacity. And this tenacity was often accompanied by a stern, uncompromising demeanor. She was driven by an unswerving conviction that she was called by God to reach out to the poorest of the poor, and this conviction left little room to entertain the objections of government officials, church authorities, or even military leaders. Mother Teresa of Calcutta was born Agnes Gonxha Bojaxhiu in Albania in 1910. Her father was a businessman whose death when she was 9 years old left the family in difficult financial circumstances. But their faith sustained them. With her mother and brother and sister, Agnes attended church every day, and she sang in the church choir. Her widowed mother, though nearly destitute herself, volunteered in the neighborhood, caring for an invalid alcoholic woman and later taking six orphaned children into her own home. It was a model of servanthood that did not go unnoticed by young Agnes. The joy of serving God stayed with her, and in 1929, at age 19, she was in Calcutta preparing to become a teacher and a nun. From the beginning, she was concerned for the poor, but for two decades, her assigned ministry was in the classroom—primarily at the Loreto Convent, where she taught geography to schoolgirls. She loved her students and they loved her, and soon they were joining her on weekends as she went into the streets to care for the sick and the hungry. At 38 Mother Teresa left the security of the Loreto community and exchanged her black and white nun’s habit for garb of the street—a white and blue sari. With permission from the pope a year later, a new religious order was born. All of the members were required to take the three basic vows of poverty, chastity, and obedience, as well as an additional a vow of pledging service to the poor, whom Mother Teresa spoke of as the embodiment of Christ. The nuns were not cloistered, and there was no vow of silence. They lived simply, shared work equally (Mother Teresa helped with the daily washing until she was too feeble to do so), and served the dying and destitute with food, medical supplies, and companionship—whatever they needed most. Bathing a leper would be her lasting legacy. Of course, she will also be remembered for the international recognition she received, the thousands of nuns who followed her, and the hundreds of homes established around the world. But the image imprinted on the global psyche would be that of a tiny wrinkled old woman reaching out and touching those consigned to the trash heap of humanity. In my television interview with Mother Teresa, I raised the point as to whether, in view of the commonly held opinion that there are too many people in India, it was really worth while trying to salvage a few abandoned children who might otherwise be expected to die of neglect, malnutrition, or some related illness. It was a point, as I was to discover subsequently, so remote from her whole way of looking at life that she had difficulty in grasping it. The notion that there could in any circumstances be too many children was, to her, as inconceivable as suggesting that there are too many bluebells in the woods or stars in the sky. In the film we made in Calcutta, there is a shot of Mother Teresa holding a tiny baby girl in her hands; so minute that her very existence seemed like a miracle. As she holds this child, she says in a voice, and with an expression, of exaltation most wonderful and moving: “See! there’s life in her!” Her face is glowing and triumphant; as it might be the mother of us all glorying in what we all possess—this life in us, in our world, in the universe, which, however low it flickers or fiercely burns, is still a divine flame which no man dare presume to put out, be his motives never so humane and enlightened. Ruth A. Tucker is the author of 13 books, including From Jerusalem to Irian Jaya: A Biographical History of Christian Missions. 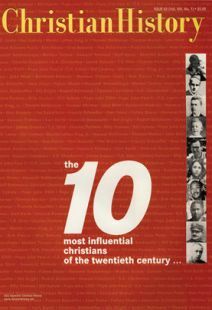 No Christian played a more prominent role in the 20th century’s most significant social justice movement.